Weighty Matters: Hike to Help the Bruce Trail! When I was growing up, my father would take me hiking on the Bruce Trail - Canada's oldest and longest public footpath that runs in Ontario from Tobermory all the way down to Niagara Falls. 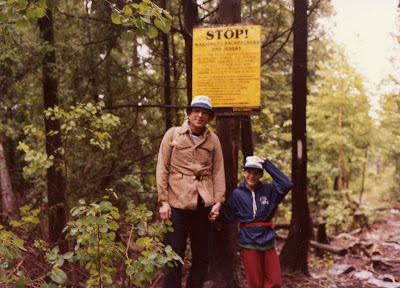 That photo up above is me and my dad on the trail circa 1983. The first time I saw Niagara Falls was after I had walked there. Now I didn't walk the full 850km in one go, but rather we whittled away at it, weekend by weekend until I became hiker #1139 to complete it. It was my weekends on the Bruce that likely made hiking a passion for me and since then I've put my boots down all over the world, even hiking the Alpine Pass Route in Switzerland, from Lichtenstein to France clear across the Alps (some of my toenails fell off during the course of that one). The Bruce Trail Conservancy has been working actively to try to purchase all of the land the trail runs on so as to protect it for future generations and while they've purchased over half of it, there's still a long way to go. This summer you've got a unique opportunity. Almost simply by hiking you can help the Bruce Trail Club raise up to $50,000 for land purchasing. How? As part of their "Boots on the Bruce" campaign bootmaker Keen has agreed to donate $5 to the Bruce Trail Conservancy for every pair of boots or shoes photographed on the Trail (any make'll do - they don't have to be Keen). So really all you've got to do to help is head over to the Bruce Trail Conservancy site and figure out a hike (clicking here gets you to a page with 40 of the most beautiful hikes). Hike. Take a picture of your boots and upload that photo to Keen's Boots on the Bruce page, and suddenly, you've helped future generations enjoy one of North America's most beautiful hiking paths.